The cap guns that kids use and poppers that they throw at the ground aren't just annoying. They contain one of the most unstable diy compounds that anyone could lose a hand to. The worrying concoction, called Armstrong's mixture, is one of the easiest, and most flammable, explosives that anyone would care to make. There are about a hundred internet tutorials on how to make Armstrong's mixture. It's not hard. It's also not a good idea. The mix is a grouping of red phosphorous and potassium chlorate. This doesn't seem like too much of an explosive combo. Potassium chlorate is a potassium atom and a chlorine atom surrounded by three oxygen atoms. It does supply oxygen to any type of fire or explosion, but has less oxygen on tap than the potassium perchlorate molecule, which has four oxygen atoms. Red phosphorous does burn, but it's been treated so it doesn't burn on contact with air at low temperatures, the way white phosphorous does. And yet this is what happens when you give the mixture a bit of a tap. The immediate explosion is why the mixture is popular in things like cap guns and those little paper packages that explode when you throw them at the sidewalk. All it takes is a little tap and the powder ignites. The problem is, it doesn't always take a tap. The mixture can go off via impact or heating, but it can also be triggered by friction. Friction can be as minor as on grain jostling against another during transport, which is why, to be shipped around, the phosphorous has to be soaked to keep it from going off. A gram of the stuff can take off a part of a hand, or bore a hole through a can. In caps, and fireworks, we see loads of powder no bigger than 10 milligrams, which is why there aren't too many kids out there missing thumbs. 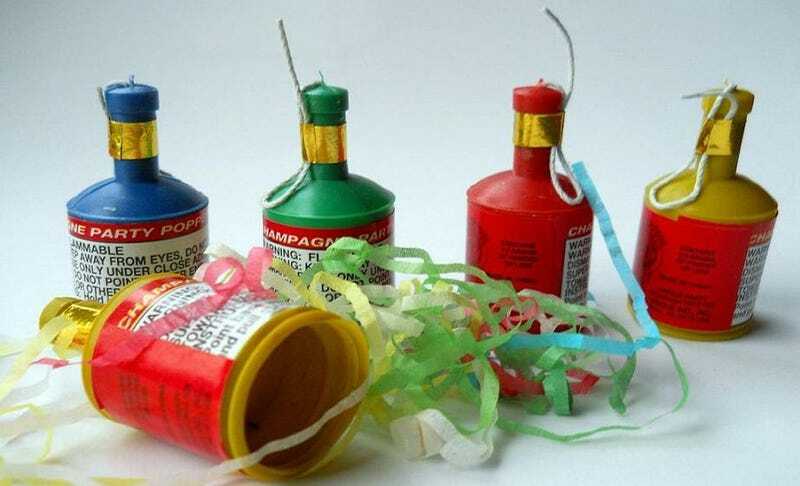 Still, it's funny to realize that a notorious and unstable explosive is used in children's toys. We've armed them. Our only hope is that they don't rebel against us. Via Fireworkstown and Impact Firecrackers.